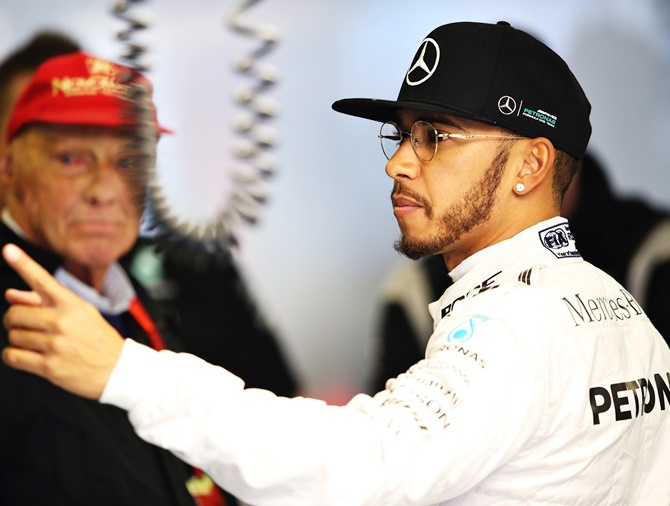 IMAGE: Mercedes GP's Lewis Hamilton in the garage during practice ahead of the Australian Formula One Grand Prix. Photograph: Lars Baron/Getty Images. World champion Lewis Hamilton topped the timesheets for Mercedes in both practice sessions of the Australian Grand Prix on Friday but team mate Nico Rosberg crashed as waterlogged conditions put a dampener on Formula One's season opener. With intermittent showers blighting the day, the teams head into the race weekend short of set-up work and lacking valuable data on their tyres, meaning qualifying could be a lottery. Hamilton, bidding for a third successive title with Mercedes, could at least be satisfied with his pace, having been fastest on intermediate tyres in the second session and with the soft set in the first. The Briton posted a lap of one minute 29.725 seconds in the opener, more than four-tenths of a second quicker than Red Bull's Daniil Kvyat, then 1:38.841 in the second session on an Albert Park track rendered too wet for dry-weather tyres. Force India's Nico Hulkenberg was second quickest in the later session, nearly half a second adrift of Hamilton, with Ferrari's former world champion Kimi Raikkonen third. Rosberg, who won the final three races of last season, had a day to forget. Sixth fastest in the opening session, he skidded at turn six in second run and damaged his front wing in a collision with the barrier. The German rolled slowly around the track for a few moments before being called to stop, as Mercedes motorsport boss Toto Wolff glared at a television screen in the garage. Red Bull had a better day, with Kvyat's Australian team mate Daniel Ricciardo third behind the Russian in the initial run and fourth-quickest later on. "With the conditions like that and going into an interesting qualifying format tomorrow, it could be an opportunity for us," Ricciardo told reporters. "Hopefully we can sneak up a couple of rows further up than we could in dry conditions." McLaren also had reason for cheer, with drivers Fernando Alonso and Jenson Button posting the sixth and seventh fastest times in second practice, just over a second off Hamilton's pace. Four-time champion Sebastian Vettel, tipped to threaten Hamilton's ambitions of a fourth title overall, was eighth quickest in the second session after failing to post a time in the first as gusty winds buffeted the street circuit all day. Seven drivers, including all from Renault, Williams and Sauber, did not trouble the timers in FP2, with teams seeing little value in testing the car in the wet. New team Haas, the first US-owned F1 outfit in 30 years, had a cautious debut with French driver Romain Grosjean and Esteban Gutierrez posting slow times in both sessions. All you need to know about Formula One teams is HERE!